If I could thumbs this post up I so would. Clear Sky Clear Sky Clear Sky Clear Sky Clear Sky Clear Sky Clear Sky Clear Sky Clear Sky. thing was the last straw for me. I nearly chucked the book out the window on that one. Spottedleaf died a second time. I've got hundreds [exaggeration] of cats I don't particularly like. I can't really decide on the cat I dislike the most. I'm going to try to address the cats I dislike the most first but I don't really have a fine line between cats I hate and cats I don't care much for. Rowanstar - I'm not sure if this cat is just one of those "Ehh, Not the best cat" or "What a horrible cat". I know I'm not fond of him, however, because of how much he acted like Onestar, getting all worked up when ThunderClan tried to help his clan in Bramblestar's Storm. I might be a bi off by that statement. I haven/t read the Warrior Cats series in forever. Onestar - Same reason for my dislike of Rowanstar. Except Onestar was even a more so jerk, in my opinion. Rowanstar wasn't too terribly aggressive (he didn't try to bite off ThunderClan out of the blue) but Onestar would just randomly pick fights with ThunderClan. Firestar - He didn't have a bad personality which as the problem: He was way too perfect and was especially annoying in the third and fourth arc. Squirrelflight - I didn't mind her high energy (I'm more energetic than her). She just wouldn't stop questioning every single little thing any cat ever said or did. Bluestar - She was way too snippy and at the end, harsh. After Tigerstar (Tigerclaw)'s betrayal, she didn't have any faith in anybody. She was extremely rude to all of her clanmates (through Firestar) and had gone off the edge at the end of her life. I was jumping with joy (not literally) when finally, she died. There are so many other cats but I don't really have the time to name them all and their reasons. Pronouns: Windy, Wind, Blizzy, Blizz, Blizzard, Sooty, Soot, etc. Because what is the logical thing to do if someone you hd feelings for didnt want to be your mate? "People who can't throw something important away, can never hope to change anything." I don't actively hate certain cats with a burning passion, because after a while you just get used to how.. odd and mary/gary stu-like the majority of them are but the one cat who annoys me the most would have to be Spottedleaf. From the very beginning she just seemed like a filler medicine cat and the whole "Firepaw x Spotted" thing is pretty bizarre. Firepaw at the time displayed no feelings towards Spottedleaf and then suddenly when Clawface kills her he changes his mind and gets all sad about it. Why? I have no papaya clue. And then in. every. single. book. she's there to be sweet and help progress the story. As it stands, Spottedleaf is nothing more than a character there to fill in missing gaps and move along the story. Also the only reason Spottedleaf died was so that Firepaw didn't have to have a hard time choosing between Sandpaw and Spottedleaf. I dislike Darkstripe the most because he is a pretty evil cat. Ironically, I used to like him a lot. I dislike how he treated Fireheart like crap without justification and always wants to punish him just for being born a kittypet. He also breaks the warrior code for multiple bad reasons, such as abandoning his whole Clan to perish from a pack of dogs. And all he wants to do is follow Tigerstar and do everything he says. End of story. I don't like Scourge or Tigerstar very much because they're Gary sues. Same for Firestar. 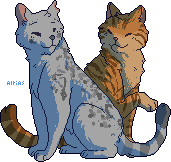 Other cats I'm not a fan of are Spottedleaf and Clear Sky. I do not mean to offend anyone who likes these cats. i remember when i was that pathetic. Jumping on the Ashfur train. I adored him in the beginning of the series, and throughout The New Prophecy. What they did with his character was (somewhat) necessary, but I'm still disappointed. The Three could have easily found out the truth another way. I'm moreso disappointed with how they handled a cat who schemed to murder his leader, and justified him by saying 'he simply loved too much'. He also tried to murder three kits, in front of their mother, and plotted to out their secret at a Gathering meant for peace. Yet he still ended up in Starclan. Did Mapleshade not love too much, as well? Her kits died, because of their Father, and all of Thunderclan. Everything she did was out of the bitterness that she had lost everything (certainly more than Ashfur); and yet, she made her way into The Dark Forest. Also not a fan of Firestar in the third and fourth series. His arc was over; let the story focus on the new. I was never a Spottedleaf fan. Ever. She was so shoehorned in that she became so unlikable to me. I guess I don't like plot points that don't make too much sense like that. My least favorite character would be...Needletail. Lets say I love her and hate her at the same time. Like she is nice to Violetshine and all but I am like why NOT LISTEN TO YOUR LEADER. But I still love her. But Rowanstar was a disappointing leader but a good leader. I feel bad for Blackstar because he must feel guilty for Shadowclan falling apart because he chose Rowanstar as his deputy. This is just my opinion, guys! I didn't like any villains like Tigerstar, Brokenstar, and Mapleshade. They were just evil. I also hate Millie,and Daisy. Firestar had no reason to let in Daisy. If the farmers were about to sell her kits, Forested still didn't have to let her join the clan! Plus, I hate her sassy personality. Graystripe shouldn't have been allowed to let his Kittypet mate with him. That's why Firestar is not a favorite of mine. He just let in a bunch of strays to his clan. At least Purdy did something on the journey in Moonlight. I also dislike Bramblestar as a leader. He just feels inexperienced to me even though he's not. Firestar did another wrong act by accepting a cat as his deputy that hasn't even mentored an apprentice. Plus, Brambleclaw allowed Stormcloud, another one I hate, to stay! Firestar was a cat from a prophecy. He and Purdy (who should be got a warrior name) were the only ones a see acceptable. Then I don't like Briarlight because she contributes to why I hate whiny Millie and she shouldn't have still been a warrior after that. She should be been an elder or something in my opinion. She didn't help anyone in the command just hogged the medicine den anyway. I would see her more a nuisance, honestly.